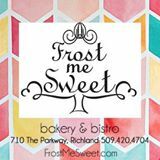 Frost Me Sweet is the sweetest place in town! Serving a fantastic lunch and dinner menu, the best local wine selection and micro brews. Our popular bakery side serves gourmet cupcakes, cheesecakes, bars, and many other fantastic goodies. Large comfortable couch areas for gathering with friends to catch up, or a fun night out!